Preparing your home for sale is the key to more money and less stress. Your house has been listed for sale for 30 days. “Good news,” said your agent on the other line, “We have received an offer”. After a couple of days back and forth negotiating the usual price and terms, an agreement is finally reached. It is lower than what you originally wanted, but based on what you have been hearing in the media, you decide to accept it. You enter escrow. Just because escrow has been opened, don’t assume the negotiating has ended. Your goal is to get the most money possible by selling your house at the highest price. The Buyer’s objective is to pay you less during the second round of potential price reductions. How does that happen? You ask. As long as the escrow process is open and ongoing it is a living breathing entity. It can move back and forth and advance to a closing. It is alive until one party cancels, then it dies. A good buyers agent may schedule several inspections. First the standard general home inspection and then possibly plumbing, sewer, fireplace, electrical, roof and pool if it exists. It is easy and common these days to spend up to $1500 to check the condition of the property. Odds are on the Buyer’s side that each one of these inspections will turn up issues that need to be repaired and addressed. When homes are 60 – 100 years old obsolescence and deterioration have occurred. Construction materials and processes have changed. Each issue will usually have a monetary value applied to it. The equity you had when you reached an agreement can quickly begin to evaporate when you begin to negotiate the repairs and the changes which the buyer is proposing. The ideal time to think about this is not during a 17 day inspection period but before you put your house up for sale. If a $5000 paint job can net you an additional $20,000 on the sale of your home, then spend a few dollars to investigate the current condition of your home. Seeing it through the eyes of the Buyer or home inspector can also save you thousands in the sale. Most everyone likes surprises, however, surprises during the escrow and inspection process can be very expensive and they never work in favor of the Seller. Once uncovered, they will do one of two things: 1) cost you money or 2) allow you to put your house back on the market and start all over because the buyer has new information that has changed their mind. There are several things you can do to minimize the issues a buyer may find with your property and minimize the cost of possible concessions. Save yourself time and money! Consider the graduating high school senior facing the escalating high cost of college. There are plenty of opportunities to apply for a multitude of available scholarship money to help defray tuition. The application process may take some time but the potential rewards can be a few thousand dollars. The same situation applies when selling your property. That is why the name of our free pdf is “Preparation”, the Key to a Successful Home Sale. Many of the things you can do for yourself, others may be better for your agent to take care of, providing they do the research. Believe it or not, a Buyer may be willing to pay you more upfront with the intention of negotiating the repairs in hopes of a lower price. Furthermore, they may think that after you have been in escrow for two weeks you may be more acceptable to a price reduction as opposed to putting your house back on the market and starting all over again. Often times negotiating your existing offer to a successful close can be your best option provided you can make it a win-win situation. Everything is all smiles and giggles until it becomes time to remove all of the contingencies and go forward with the purchase. 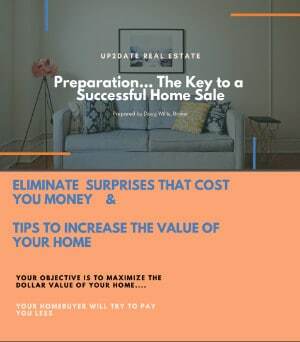 If you have performed your “Preparation” as advised in the free pdf, you will be in a great position to sell your home.